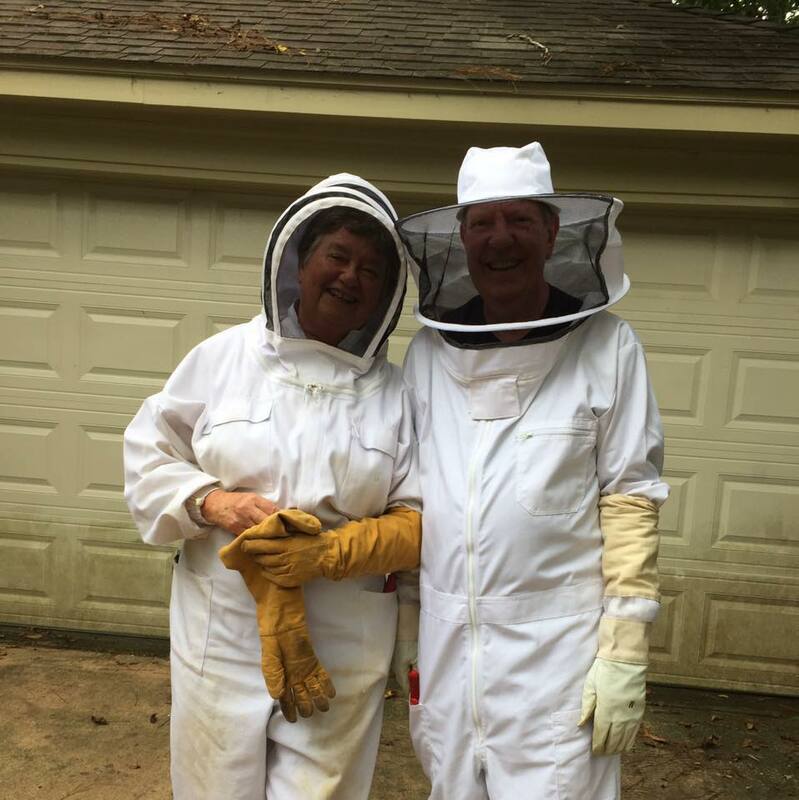 The European honey bee (Apis mellifera) may not be a species endemic to Central Texas, but there is no disputing the powerhouse role they play in pollinating our native flora and our agricultural crops. It’s no wonder seeing them in action is quite fascinating to many naturalists, be they curious adults or schoolchildren. 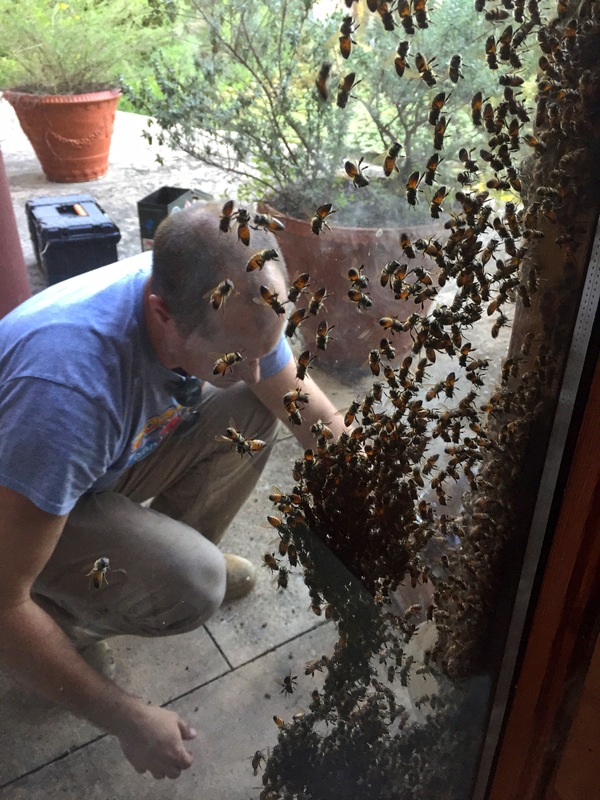 As such, the Austin Nature and Science Center has long kept a demonstration hive just inside its main building where visitors can see the inner workings through its plexiglass walls. Brandon Fehrenkamp, owner at Austin Bees, has been the manager of that hive for some time. 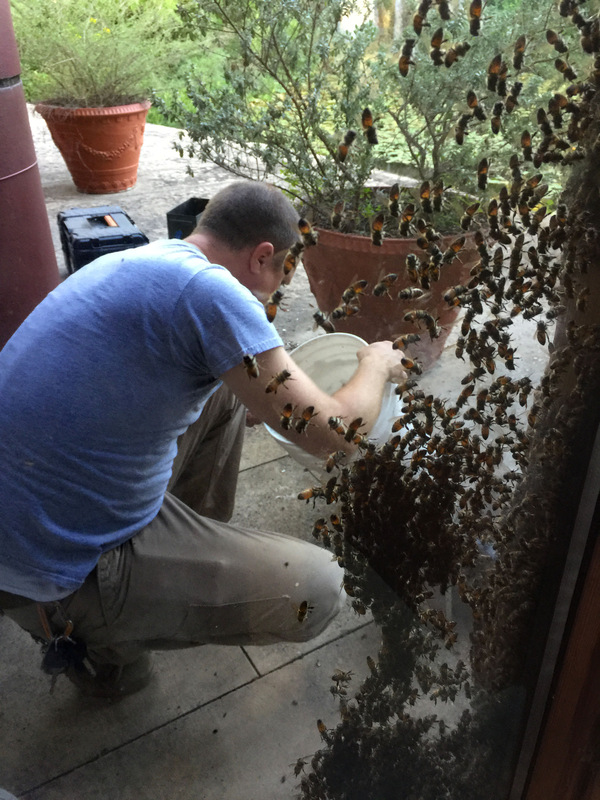 Along with the more regular tasks of checking on their health and other hive maintenance, he also draws on his tech background to set up Raspberry Pi-based webcams to check in on them. I’ve been aware of Brandon’s work for a couple years, and spoken to him on a few occasions about it. But I’d never seen him in action. Until last night. 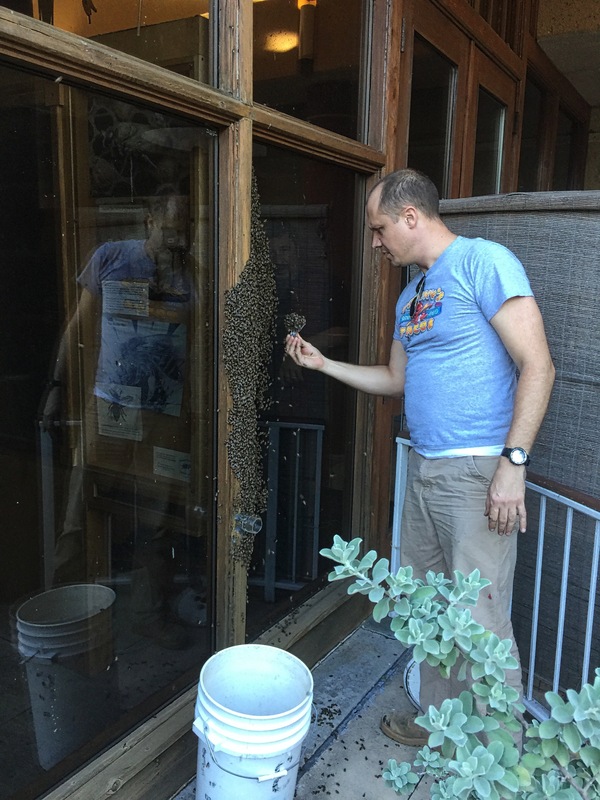 ANSC’s Exhibit Coordinator, Josh Ransom, had been getting calls throughout the day saying the bees were doing something unusual. Brandon got the call, and – just in time for CAMN’s monthly meeting – showed up with gear in hand to diagnose what was happening. A lot of lucky CAMN visitors got a chance to see him work up-close, many of us just a couple feet from the swarm. (For those worried about stings, one could still view the activity from inside the visitor center lobby). 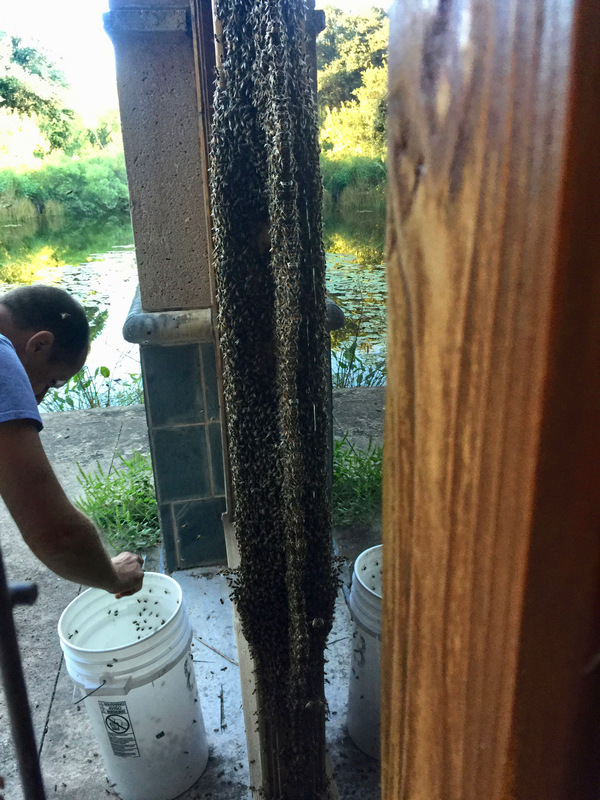 Using a smoker filled with smoldering newspaper to calm the bees, an open 5-gallon bucket, and a small scoop to move bees to the bucket, he began sifting through to find the “queen” bee. (Brandon doesn’t actually like the term “queen” with relation to the specialized egg-layer in the hive as it connotes control and a hierarchy that just isn’t there – she has a specialized job to lay eggs, and that’s it.) Normally, she’d be marked by humans with a yellow dot on her thorax to make her easier to locate. Despite a lot of sifting – and a few stings – he didn’t locate the yellow-dotted queen, but rather a different, unmarked one. Sifting through to find the queen bee. While honey bee stings are not terribly painful in most circumstances, they’re not completely pleasant, either. The Schmidt Pain Scale for Stinging Insects places them at the low end of the scale, but doesn’t recommend being stung on the tongue. What’s the worst? That really depends on where on your body you’re stung just as much as by what stung you. But the so-called “cow-killer”, or red velvet ant (Dasymutilla occidentalis) gets some pretty good play, especially if it were to get you on a nostril. It’s actually a flightless wasp. Ants and wasps are closely-related, though newer gene-sequencing research suggests ants and bees are more related. All three are part of the Hymenoptera order of insects. And yeah, we have both of those in Texas, too. Natively.